Lee Voon Loo (centre), holding the award certificate flanked by Ms Lim Mei Shyan (left), Dean of the Faculty of Computing and Information Technology (‘FOCS’) and Dr Lim Yee Mei (right), Associate Dean of the Department of Computer Science and Mathematics, FOCS. 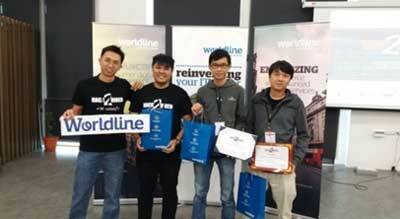 Lee Kang Wenn (2nd from left), Ong Zhe Zhun (3rd from left) and Bornluck Chong Tianler (extreme right), 2nd Runner-Up winners of the Worldline Challenge posing with Mr Chong Chee Wei (extreme left), Solution Consultant from Worldline, one of the sponsors for the event. 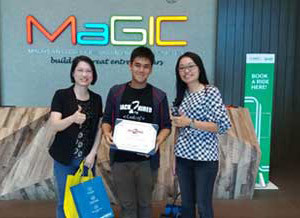 Bornluck Chong Tianler (centre), winner of the special prize in Mini Hack Challenge, C# Category, flanked by Mr Koay Kah Hoe (left), Principal Consultant, Dream Catcher Consulting Sdn Bhd (left), the organiser, and Cik Khairul Mazwan (right), Program Manager, Community & Outreach, Malaysian Global Innovation & Creativity Centre (MaGIC). Lee Voon Loo (4th from left) and Loo Ann Gie (2nd from left), winners of the special prize in Warm Up Challenge with Ms Lim Mei Shyan (extreme left) and Dr Lim Yee Mei (extreme right) and the rest of the TAR UC participants. 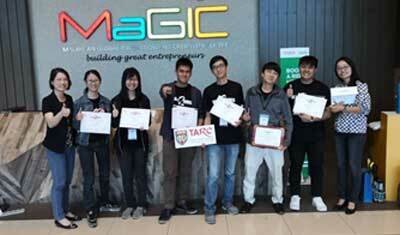 TAR UC students registered the biggest win in the Hack2Hired Software Hackathon held on 14 - 15 April 2018 as they won a number of prizes in the said competition organised by Dream Catcher Consulting Sdn Bhd. The objective of the event is to serve as an avenue for final year students and fresh graduates to showcase their programming talents for employers who are scouting them. 1. Lee Voon Loo, Bachelor of Computer Science (Hons) in Interactive Software Technology. 1. Lee Kang Wenn, Bachelor of Computer Science (Hons) in Software Engineering. 2. 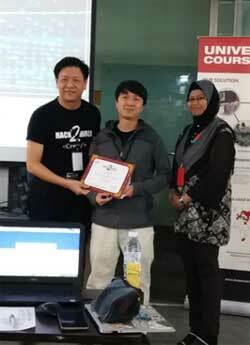 Bornluck Chong Tianler, Bachelor of Information Technology (Hons) in Internet Technology. 3. Ong Zhe Zhun, Bachelor of Information Technology (Hons) in Software Systems Development. 2. Loo Ann Gie, Bachelor of Computer Science (Hons) in Internet Technology. Lee Voon Loo, the Champion who teamed up with students from another institution had a lot to say about how his internship and TAR UC had helped him in the competition. "I think the main thing that helped me in the competition was the experience that I had gained during internship. In my internship, I had been given solo projects that I had to complete in a short amount of time, which really forced me to think and code faster than I normally would. Besides that, at TAR UC, there are many good lecturers who have taught and shaped me into who I am as a programmer and the knowledge and skills that I have gained helped me win this competition."